Players of the farming / life sim Stardew Valley have been avidly awaiting its in-development multiplayer update. The game’s creator, Eric “ConcernedApe” Barone, recently shared that multiplayer is “coming along great” and that “it’s only going to get better before release” on his Twitter. While we can’t expect to see the multiplayer update before 2018, we recently learned even more content that will affect single-player will be coming with the patch. 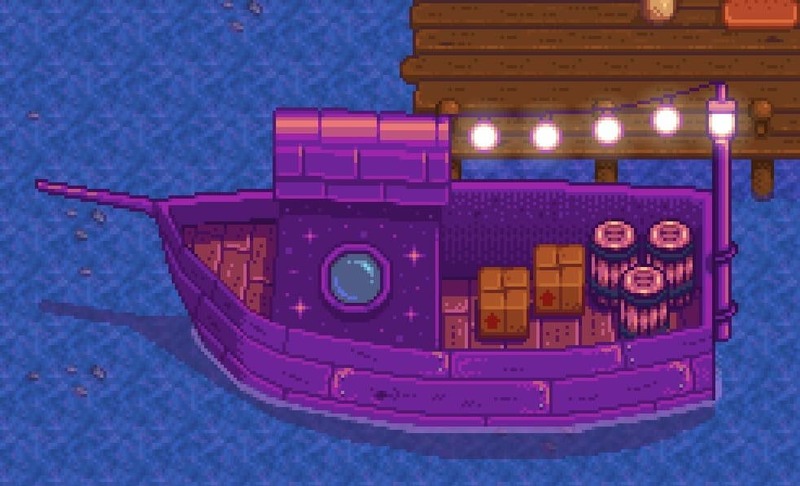 The shared screenshot is of a purple boat with string lights, a couple boxes, and a few barrels. It appears to be located at the docks by Willy’s shop on the beach, but no other details were shared about its functionality. Since Barone said this content will “affect single-player, too,” we can assume the boat can also be used in multiplayer mode. But for what? Maybe the boat can be rented to take a love interest out on a romantic ocean cruise. (Can you imagine stargazing with Abigail while sipping wine on a late night boat ride? Sigh.) Or perhaps it will be used to reach deeper waters to catch new species of fishies? Or both. Both would be good. The upcoming update which will add multiplayer mode and the mysterious boat content should arrive in 2018 for all platforms, though it will likely see a PC release first. Stardew Valley is available now for PS4, Xbox One, Switch, and PC.